The U.S. Bureau of Reclamation (USBR) has announced the initial 2015 water supply allocations for Central Valley Project water users. For the second year in a row, allocations for junior water rights holders are set at zero, while contractors that supply municipal & industrial uses, as well as the Friant Division Contractors, will receive enough water to meet health and safety needs. USBR did note that allocations could still increase, should supply conditions improve. The Department of Water Resources (DWR) has increased allocations of State Water Project (SWP) water to 20%. This is the second increase this season; in January, DWR increased allocations to 15%, up from December’s 10% allocation. Despite these consistent increases, deliveries will still be far below the 4.2 million acre-feet requested by the 29 agencies that receive water from the SWP. The SWP has not delivered 100% allocation since 2006 and delivered only 5% in 2014. 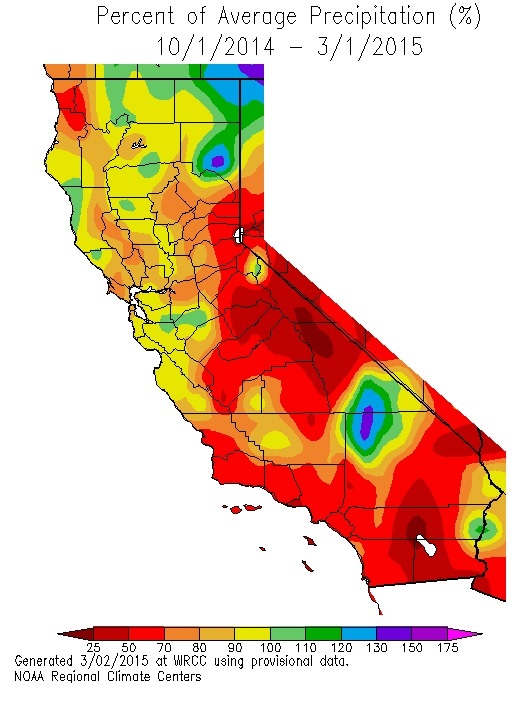 The California Department of Fish and Wildlife presented promising salmon run forecasts for the coming season. In addition, the East Bay Municipal Utility District reported that 12,118 salmon returned to the river last fall, making last year’s run the fifth-highest in 74 years. And the Pacific Fisheries Management Council released 2014 stock assessments for the Klamath River that were higher than predicted. 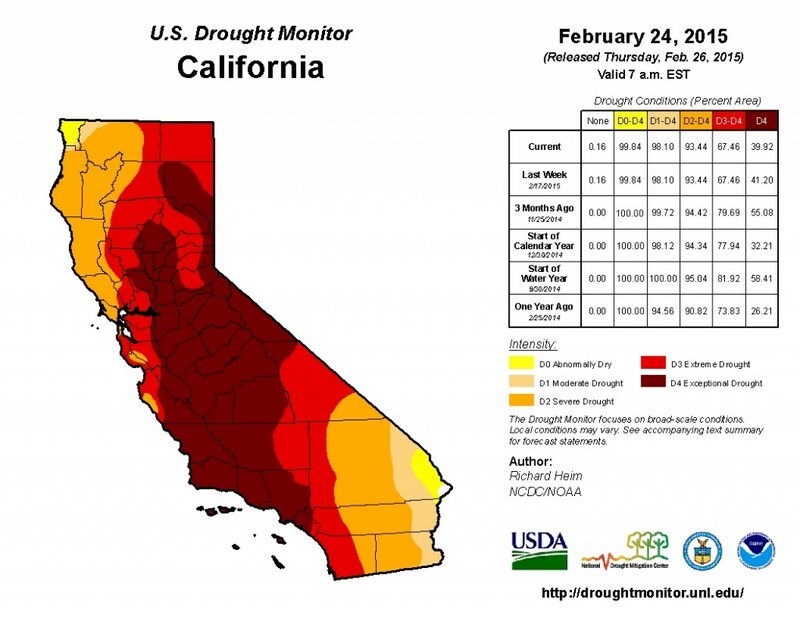 Drought conditions have not changed much from two weeks ago. Average precipitation for the water year (which begins October 1st) is still at or below normal for much of the state. 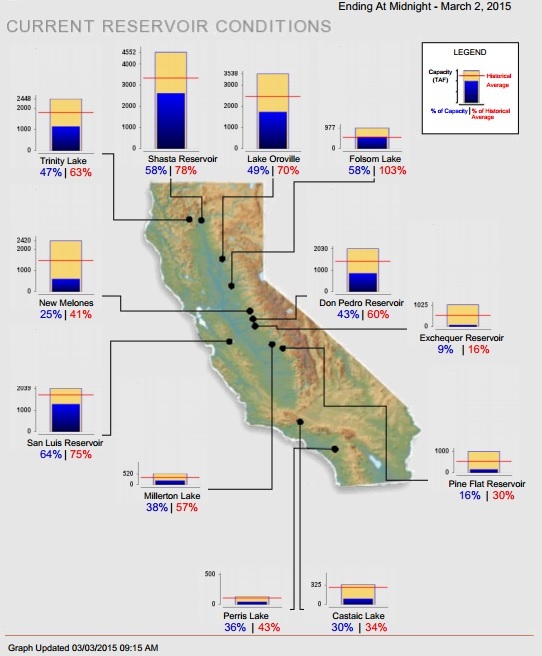 Statewide, California’s major reservoirs (representing 26.6 million acre-feet of storage) are at 45% of capacity and 67% of average.